Okay I have gone and done it! I created a new clique. These things are so much fun and so addicting! Mine is the Obsession Clique. 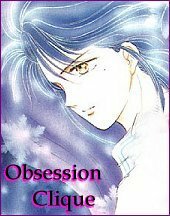 You only need a anime character as your obsession. Video game characters and J-rock J-pop stars are fine too! ^_^. Here is what my fragment looks like. When you do yours, just replace Nuriko with your own obsession! ^_~. Also replace my site id with your site id number. That is all there is! Ready to join? Great! Sign up Here. The html fragment will be sent to you in the mail you get after submitting your page to the quene.